Save more with a full range of Oxford notebooks and notepads for home or office at the Post Office Shop. 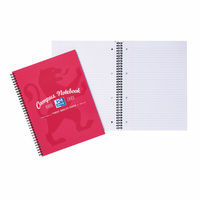 This range includes various sizes and packs including multipack notebooks and notepads. See all items Stay traditional with Oxford Office Classic Colours notebooks and notepads. See all items Express yourself with Oxford Office Vivid Colours notebooks and notepads. See all items Capture your thoughts and key details with our range of Oxford Campus Notebooks. See all items Take notes to keep close to hand with the Oxford International notebooks range.